Yeller Dog Ranch: Seen Enough Hats Yet? Help! I can't seem to stop the hats! 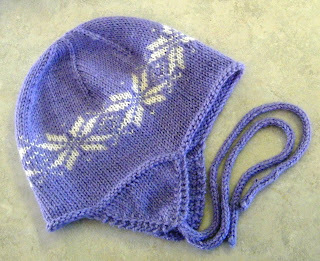 This particular pattern by Tienne is very rewarding and knits up so quickly, it's like almost-instant gratification. I have another one in the planning stages as well. My husband wants one in this style. I'm digging through my stash for some manly colors. I may have to get out the dye pot... Hard to picture this as a manly hat when looking at this cute little number isn't it? It can be done! I've been looking on Ravelry at this pattern (here for Ravelry members) already done for men, and some of them are really good. Of course, it will be about twice as big so it won't be quite as quick, but I will be satisfied if he likes it.